Betta - from$ 10 to$ 500 at an interest rate of 1.3% per day, accrual of mon-Fri, term of Deposit 35 working days, the body of the Deposit is returned. Standard - from$ 500 to$ 1000 at an interest rate 2.1% daily term of Deposit 70 calendar days the Deposit is returned. 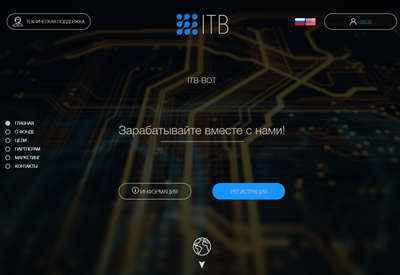 ITB - from 1000$ to 30000$ at an interest rate of 3% daily term of Deposit is 100 calendar days, the body of the Deposit is returned. 26.03.19 07:01 Transfer Sent Payment: 60.00 USD to account U12456834 from U1294xxx. Batch: 252652857. Memo: Shopping Cart Payment. Order 866556. 27.03.19 20:15 Transfer Sent Payment: 100.00 USD to account U12456834 from U17755**. Batch: 252907455. Memo: Shopping Cart Payment. Order 872730. 28.03.19 10:51;Account;Receive;Received Payment 1.56 USD from account U12456834 to account U1294000. Batch: 252977676. Memo: API Payment. PayKassa.pro 874340. 03.28.19 17:33	Account	Receive	+3.00	Received Payment 3.00 USD from account U12456834 to account U17755**. Batch: 253039019. Memo: API Payment. PayKassa.pro 875655. 03.29.19 21:38	Account	Receive	+1.3	Received Payment 1.3 USD from account U12456834 to account U17755**. Batch: 253191828. Memo: API Payment. PayKassa.pro 878644. 30.03.19 11:50;Account;Receive;Received Payment 1.56 USD from account U12456834 to account U1294000. Batch: 253249426. Memo: API Payment. PayKassa.pro 879768. 03.30.19 21:57	Account	Receive	+1.3	Received Payment 1.3 USD from account U12456834 to account U17755**. Batch: 253300755. Memo: API Payment. PayKassa.pro 880771. 01.04.19 11:33;Account;Receive;Received Payment 1.56 USD from account U12456834 to account U1294000. Batch: 253470614. Memo: API Payment. PayKassa.pro 883585. 04.01.19 20:15	Account	Receive	+1.3	Received Payment 1.3 USD from account U12456834 to account U17755**. Batch: 253897632. Memo: API Payment. PayKassa.pro 884552.